The Friends of The Waltons is a division of The Walton's Mountain Museum. Members receive a quarterly newsletter, free admission to the Museum and 10% discount on all purchases in the Museum store or by mail-order.  Annual Individual Memberships is $15.00 per person USA); $17.00 per person (outside the USA).  Annual Family Membership. Newly established. The annual fee is set at $25.00 (USA) and $27.00 (Outside the USA). The family membership covers spouse and children 18 and under. Started in 1992, at the dedication of The Walton's Mountain Museum, the Fan Club publishes a quarterly newsletter and holds an annual reunion in Schuyler. Dues are $20/year US funds. The Fan Club also publishes a cookbook. 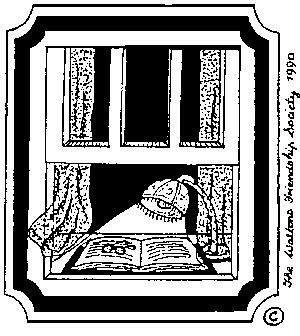 John-Boy's bedroom showing a book and lighted lamp. The Waltons Friendship Society (WFS) was begun in England in 1990 and reorganized in 1992 by Ray Knight and Irene Porter. Ray, Irene and the almost 100 other members of the Society are avid Waltons fans. The Society publishes a quarterly newsletter called MAILBOX. Subscriptions are $20/year US funds.